Relentlessly, Cyborgmatt isn’t slowing down, posting more and more of Valve’s secrets. Soon there will be only one left, and then he will step into a room deep in the heart of Valve Headquarters and take a picture of Gabe dancing around in an HEV suit. 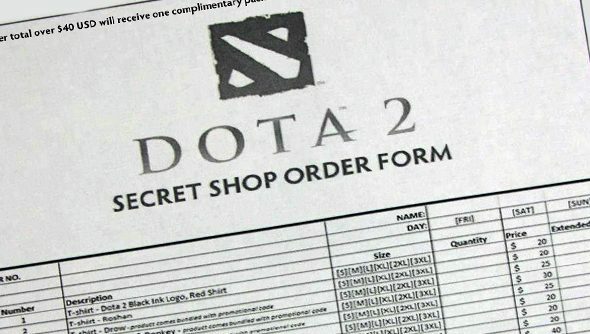 For now, he’s snapped a shot of the catalogue for the Secret Shop, Valve’s Concession Stand for the International. You can buy t-shirts, hats, pint glasses, ‘Rustic’ necklaces, scarfes, cell phone charms, posters and inflatables, and if you spend over $40 you can a complimentary pack of Dota 2 trading cards, which, sadly, means that the pictures he posted earlier of trading cards probably don’tmean that there’s a trading card game on the way. They might, however, be put on the Valve Store. Here’s hoping. Instead, for the moment, they’re limited to the attendants of the second International, the massive Dota 2 tournament that resumes tomorrow, with the Tournament stages starting, moving from the Preliminary group stages, where the teams played to sort the wheat from the chaff, and organise the Winner’s and Loser’s brackets.